This is the [website] of the Barbican Centre, which is owned, funded and managed by the Corporation of London. The Barbican Centre is committed to the highest standard and quality of information and every attempt has been made to present up-to-date, accurate information. However the Barbican Centre gives no warranty as to the accuracy of the information on this website and accepts no liability for any loss damage or inconvenience caused as a result of reliance on such information. Although the Barbican Centre takes all reasonable measures to ensure that the information provided to it from third parties is accurate and not defamatory or offensive it cannot control the content or take responsibility for pages maintained by external providers or linked pages. The Barbican Centre will take reasonable steps to ensure that data transmitted electronically to the Barbican Centre via the site or otherwise and stored by the Barbican Centre is not accessed by unauthorised third parties in accordance with the requirements of the 2018 Data Protection Act. The User accepts the risk that data transmitted electronically to the Barbican Centre via this website or otherwise may be intercepted before reaching the Barbican Centre or accessed from the Barbican Centre's data storage by third parties not authorised by the Barbican Centre and may be exploited unlawfully by such unauthorised third parties. The Barbican Centre makes no representations as to the security quality or propriety of any website which may be accessed through this website and accepts no liability for the content or for any loss or damage caused or alleged to have been caused by the use of or reliance on information contained in such websites or goods or services purchased there from. 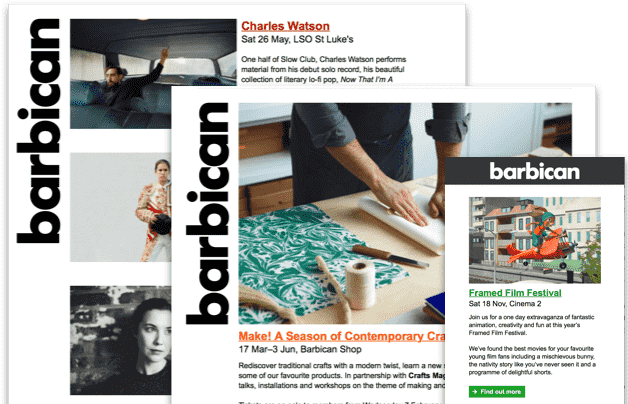 Connected websites accessed through this website are independent websites over which the Barbican Centre does not exercise any control whether financial editorial or of any other kind and are not in any way endorsed by the Barbican Centre. The Barbican Centre processes personal data in accordance with the General Data Protection Regulation (GDPR) and the Data Protection Act 2018. For full details of how and why the Barbican Centre processes personal data, please refer to our full privacy notice. Information contained in this website may contain technical inaccuracies or typographical mistakes. Information may be changed or updated without notice and any queries relating to the information including queries as to its currency and accuracy should be addressed to the person or persons stipulated in the Specific Conditions on the appropriate pages relevant to the goods or services sought. All information made available from within this website is provided "as is" for information purposes only and without warranty of any kind either express or implied including but not limited to any warranties as to non-infringement of rights merchantability or fitness for a particular purpose. View Barbican's Conditions of Sale. ‘Website’ the network location on the World Wide Web written in hypertext mark-up language (or other World Wide Web compatible language) format developed in accordance with these terms and conditions containing digital text, graphics, sound, and video which is the Customer’s proprietary site stored on a server and accessed via the Internet, being identified as ‘www.barbican.org.uk’.